Italian seasoning is a well-known herb blend used to flavor many Italian dishes, as well as tomato sauces, meats, sandwiches, soups and roasted poultry. Italian seasoning is available in the spice aisle at any grocery store, but it can also be made at home using common spices found in the pantry. Read on for a list of herbs found in Italian seasoning blends. Italian Herb Seosoning is one of the most popular herb seasoning and ussed for many dishes. It is actually a combination of different herbs: 1 teaspoon Oregano; 1 teaspoon Marjoram; 1 teaspoon Thyme; 1 teaspoon Basil; 1 teaspoon Rosemary; 1 teaspoon Sage. They are available in 100g, 250g, 500g and kg pack.Just click on the pull down box and see your options and prices for bigger sizes. 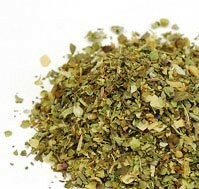 Italian Herb Seasoning is the most popular herb mix.